So-v.com, also known as Search.so-v.com, is a browser hijacker that may take over your web browsers without your permission. It usually travels in free software bundles and enters your PC unnoticed. It is important that you pay attention to the freeware that you install, because it is possible to avoid unnecessary modifications that it may cause. 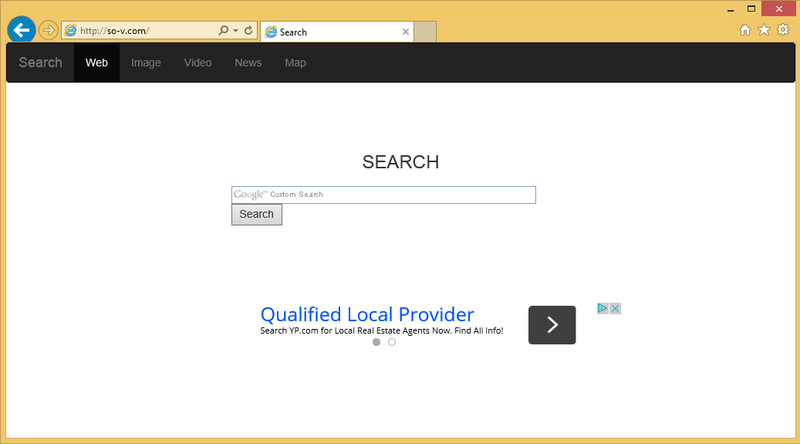 Although the hijacker may seem like a reliable search tool, that is not the case. It is aimed at making profit off of you and nothing more. The hijacker exposes you to commercial data thus promoting its sponsors. It inserts ads and sponsored links into your visited pages and search results. If you do want to deal with the unnecessary advertisements popping-up everywhere you go online, you should get rid of So-v.com without further delay. Once the hijacker gets installed, it changes settings in all of your browsers. It does not matter which browsers you use, because the hijacker affects all of them. It switches your home page and default search engine to So-v.com. The site has a search box with such parameters as Web, Image, Video, News, and Map. If you enter a query into the box, you will get presented with results from Google Custom Search. These results will include additional sponsored links that do not come from Google. We advise against clicking on them. The results page is not the only site that will contain advertising data. The hijacker will show you ads on all sites that you visit, even if they have nothing to do with online shopping. It will also reroute you to various sponsor websites in the middle of your browsing. This will slow down your surfing speed. Moreover, the commercial content shown to you is not all reliable. You will be exposed to fake ads, which may lead you to corrupted pages. Visiting these pages could result in malware infections, financial losses, or other unwanted consequences. We advise that you eliminate So-v.com from your browsers in order to prevent that from happening. So-v.com removal can be completed in one of the two following ways: manually or automatically. If you choose to erase So-v.com manually, you will have to uninstall the app with which it entered your system and then edit your browser settings. These tasks are described in more detail in the manual removal guide presented below the article. You are welcome to use it. Alternatively, you can terminate So-v.com automatically by implementing the powerful anti-malware utility from our webpage. It will perform a full system scan and detect all potential threats. The security tool will then delete So-v.com along with other found issues. In addition to that, it will also shield your PC from various Internet-based parasites you may encounter in the future.